Christmas is nearly upon us; it’s time for eggnog, presents and… Pirates? Well, yes. As a matter of fact, Santa dressed as a pirate, or pirates dressed as Santa, is a “thing”. And it make sense, after all. 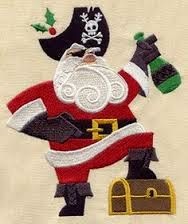 Both pirate captains and St. Nick lead rag-tag bands of outcasts. (When was the last time you saw an elf in polite society?) And they both have a history of re-distributing wealth. One reason it’s so easy to link the two is that Santa has a backstory that’s s lot more fierce than his current incarnations. The gift-bringer was once known to bring coal (representing the fires of hell) to kids who weren’t good enough. 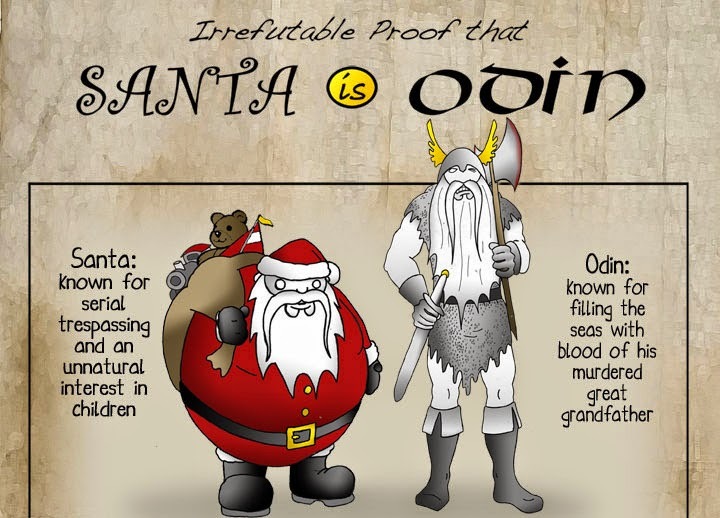 And before that, he was linked to Odin, the Norse father-god who wandered the world and occasionally meted out justice, in the forms of rewards or punishment. It’s generally believed, even by folks who don’t “Believe” in Santa, that the man in the red suit is a powerful force of nature. In movies like “Rise of the Guardians” he’s a Russian-accented powerhouse, leading the other guardians of childhood to protect the world. In “The Nightmare Before Christmas” Jack Skellington nearly wrecks the holiday, but when Santa is set free at the last minute, he calmly states that he has the power to set everything right by dawn. 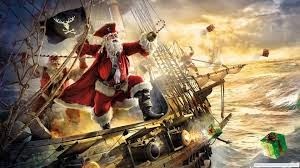 So Santa, like a pirate captain, has impressive power, and the ability to travel. 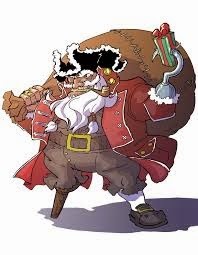 He might be carrying anything from gold to coal to the kind of odds and ends that might be accumulating in the hold of a pirate ship – or Santa’s bag of holding. Both characters are often jolly. And even though Santa is gifted with glasses of milk on Christmas Eve, no one has ever claimed that he doesn’t enjoy a mixed drink after he’s finished driving the sleigh. 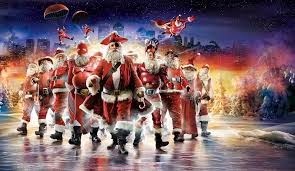 Santa’s long red coat with the white fur cuffs easily translated into an 18th century pirate coat, and red is a color that’s been associated with pirates ever since Captain Morgan donned his best red silk coat while recruiting a privateer navy to fight the Spanish. It’s even easy to see Santa in the tropics. After all, he needs some kind of vacation after the big night. 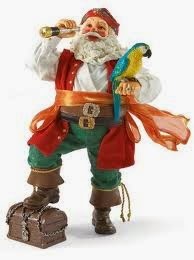 Santa as a pirate, or a pirate as Santa, is an image that goes back decades, and has been memorialized in nutcrackers, Christmas ornaments, paintings, and photos. 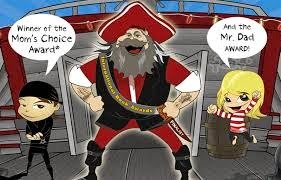 Probably the ultimate link is the children's book, "Pirate Santa" featuring Cap'n Slappy, one of the gentlemen who brought us Talk Like a Pirate Day. The story is one dear to a pirate's heart, about how Slappy, Santa's cousin, sets out to bring Christmas cheer to kids who were a little too - um - nonconforming, to make Santa's "nice" list. The book makes a grand Christmas gift for a child, and since it's available by download, it can still be purchased in time for the holiday. Or, for grownups, pick up a copy of my own novels, Gentlemen and Fortune, Bloody Seas, and Storm Season, the tales of my redheaded female pirate captain and her adventures in the man's world of piracy. So I’ll leave you all a little early tonight, as I go off to wrap my own loot. 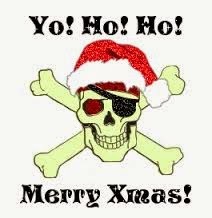 Yo Ho Ho Ho and a Merry Christmas to all! 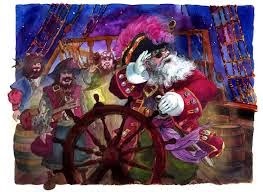 Ahoy there scallywags, you may be interested to know that a new book will be out next month featuring Santa as a pirate. And visit https://www.whitebeard.com.au/ to read chapter one for free.